Features link and menu. Press enter to navigate to this link. Press control + space to open submenu. To move through submenu items press tab and then press up or down arrow. Mobile Basics link and menu. Press enter to navigate to this link. Press control + space to open submenu. To move through submenu items press tab and then press up or down arrow. 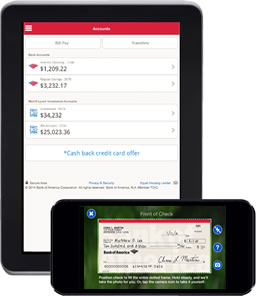 Bank of America Mobile Banking for Android™ Bank of America's mobile banking apps for Android™ give you the flexibility to bank anytime, anywhere. Download the mobile banking app today. Mobile Check Deposits are subject to verification and not available for immediate withdrawal. 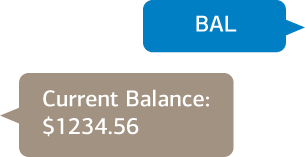 In the Mobile Banking app menu, select Get Help, then Mobile Check Deposit for details, including funds availability, deposit limits, proper disposal of checks, restrictions and terms and conditions. Requires at least a 2-megapixel camera. Data connection required. Wireless carrier fees may apply. Alerts received as text messages on your mobile access device may incur a charge from your mobile access service provider. This feature is not available on the Mobile website. Wireless carrier fees may apply. Bank of America does not charge for Text Banking. However, your mobile service provider may charge for sending and receiving text messages on your mobile phone. Check with your service provider for details on specific fees and charges that may apply.